PROFHILO® is manufactured by IBSA Farmaceutici Italia in a U.S. FDA approved site in Italy, and distributed in the UK & Ireland by HA-Derma Ltd. It is the first stabilised hyaluronic acid (HA) based product which is manufactured without the use of chemical cross-linking agents (BDDE) and is used for skin remodelling and treating skin laxity, not for just filling lines and wrinkles. According to the makers, it delivers dramatic improvement in tissue quality, even in challenging areas, and is complementary to other aesthetic treatments and dermal filler procedures. It is considered to be safe, effective and “a true breakthrough” in anti-ageing medicine. Stable hybrid cooperative complexes of low and high molecular weight hyaluronic acid. IBSA’s hyaluronic acid is an ultrapure grade hyaluronic acid, produced through a patented bio-fermentation process, of Streptococcus Zooepidemicus, which ranks worldwide as “top quality” in terms of purity, safety and its high resistance to thermal production processes. The formulation of HA with different molecular weights contained in PROFHILO is based on a concept of Hydrolift® Action. This innovative approach is aimed at counteracting the physiological reduction of HA in the skin, restoring hydration, elasticity and skin tone, by associating, in a synergistic way, deep hydration with the mechanical action of lifting the skin. NAHYCO™ Hybrid Technology combines innovation and complete safety with the production of stabilised hybrid hyaluronic acid cooperative complexes formed through a patented thermal process. Owing to this new technology it was possible to combine 32mg of low molecular weight HA (L-HA: 80 - 100 KDa) and 32mg of high molecular weight HA (H-HA: 1100 - 1400 KDa) while maintaining complete manageability. A total concentration of 64mg is produced which has never been achieved before precisely because of technological limitations. This process does not involve the use of chemical cross-linking agents, such as BDDE (1,4-butanediol diglycidyl ether), and the final product, PROFHILO, is pure hyaluronic acid. Is a skin test required before the treatment? Hyaluronic acid is completely broken down within the skin leaving no trace. Medical device. European CE Marked. 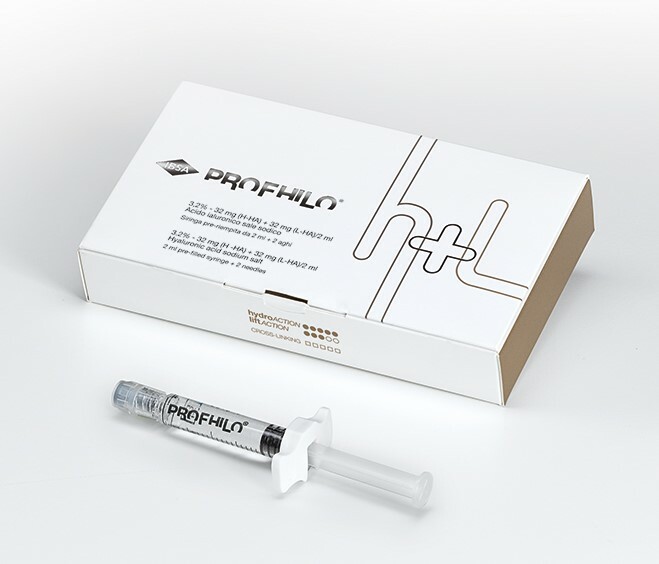 PROFHILO is available in one formulation - 64mg of hyaluronic acid in a 2ml pre-filled syringe (32mg of high molecular weight HA + 32mg of low molecular weight HA). It is indicated in areas affected by skin laxity such as the malar and submalar areas of the face – cheek and jowls. Since the launch, PROFHILO has proven to be much appreciated for its characteristics of safety, high spreadability and cohesivity (ability to stay together). These qualities have been shown to be very effective in areas typically considered difficult to treat with traditional injectable products such as the temples, forehead, hands, inner arms and neck to mention a few. 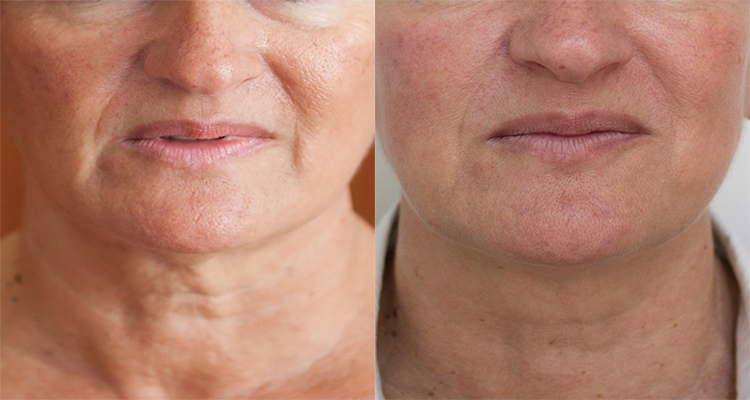 Treatment to the face is delivered by practitioners using the BAP technique – Bio Aesthetic Points - which is seen as the optimum method for placement of the product at 5 specific points on the face. Individuals with a known hypersensitivity to hyaluronic acid. Pregnancy and breastfeeding. Patients can expect increased firmness, elasticity and an overall improved quality of the skin with the effects lasting six months. Two treatments sessions are usually recommended initially, with a 1-month interval in between. Top ups and maintenance treatments can then be prescribed by your practitioner according to your body’s response to treatment. Transient erythema (redness), pain, itching, discolouration or tenderness at the implant site. This depends on the area treated and how much is required, and the practitioner doing the treatment, but price ranges are in the region of €350 - €450 per 2ml syringe, with a treatment programme costing €900. 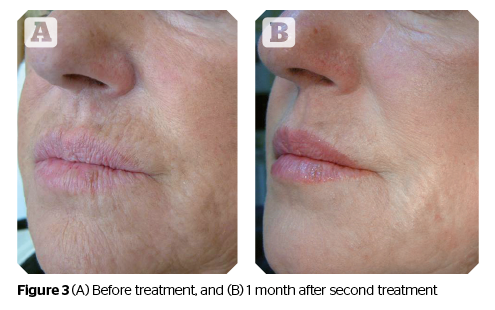 A programme is two sessions using a 2ml syringe of PROFHILO each time, spaced one month. (Before and after photographs are real patients, your results may differ). 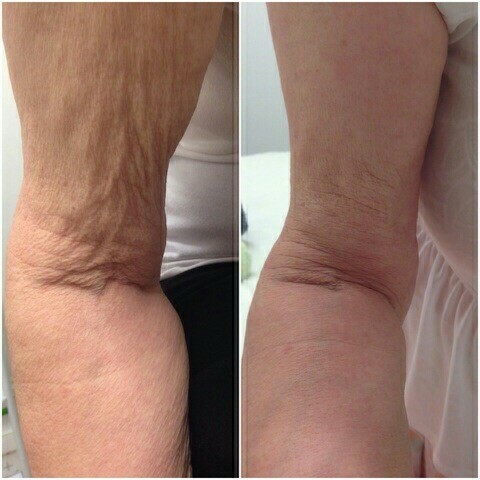 Before (Left) and After (Right) PROFHILO treatment for skin laxity in the arms. 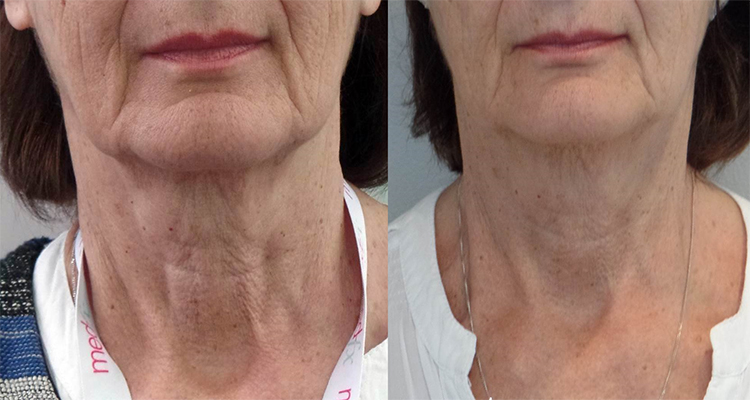 Before (Left) and After (Right) of neck treatment with PROFHILO after 2 months.